Denver--It used to be that going to the polls on election day was the great American tradition. Today the ballots are mailed out weeks ahead of time. What effect does this have on who we elect? It heavily favors the powerful forces that have the money to do continuous marketing for their candidates and issues. Mail elections appear to be grassroots-friendly. They are not. The powerful forces that want to rid us of going to the polls in our neighborhood say the mail ballot is much more convenient, that it's more tolerant of those who just can't get to the polls. The fact is those who wanted to mail their ballot could before. The convenience was there for those who wanted it and needed it. Now we all have to vote by mail. Going to the neighborhood polling place used to be a convenient way to stay in touch with neighbors. July 18 looms, SOS deadline. All comments on new election rules to implement propositions 107 and 108 are due in the Colorado Secretary of States office by this Tuesday, July 18. The meeting last Tuesday was cancelled. Call your suggestions in now, John Wren (720)495-4949. Please do not email or post here without calling John first. no idea of the consequences of 107/8. If you love our Colorado Caucus, we need your help now! As I'm sure you are aware, the passage of Propositions 107 and 108, pounded down voters throats with a million dollar ad campaign that was very misleading, along with the Election Rules that are currently being proposed will mean the eventual death of the Colorado Caucus, pushed through a special session of the legislature in 1911 to clean up Colorado politics. If we form a political committee Secretary of State Wayne Williams has given us until July 18 to tell him why the new rules shouldn't be adopted, of course, we can each individually tell him between now and July 18. 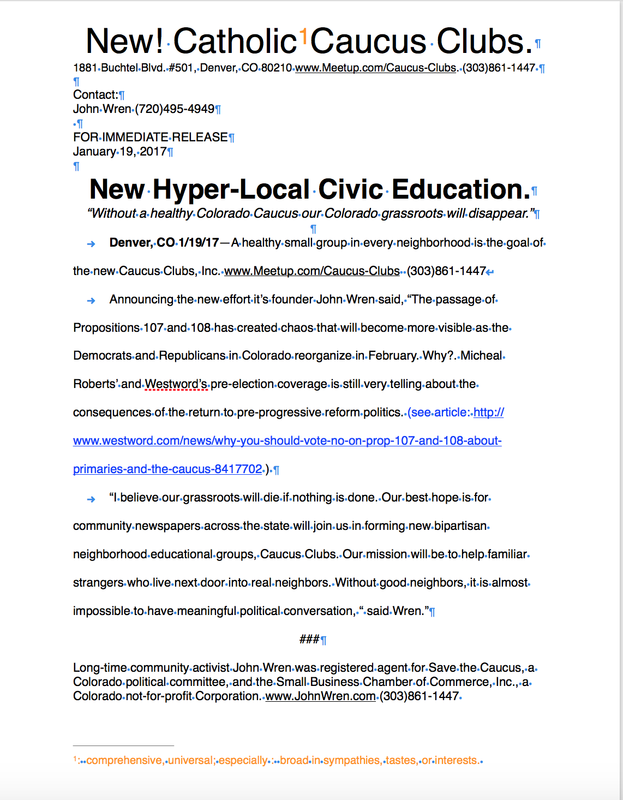 Whether we form the committee or not and I hope you will, each and every one of you reading this right now who loves the Colorado Caucus, the best chance the common person has of serving in elected public office, write Wayne and tell him why. If you have any questions please call me if you must, but much better to attend tomorrow or read the announcement that will be made there about the party if we do decide to go ahead. Please rsvp now. Thanks! WREN PROMISES FIGHT AGAINST PROPOSITIONS 107 AND 108 IMPLEMENTATION. DENVER—Long time community activist John Wren today promised a fight if Propositions 107 and 108 aren’t put on ice by Legislature and Secretary of State. “I submitted testimony that I don’t believe has been considered. Perhaps it is in the information submitted today. “I have asked the Secretary of State for a continuance of today’s Election Rules hearing before a final decision is made,” said Wren. 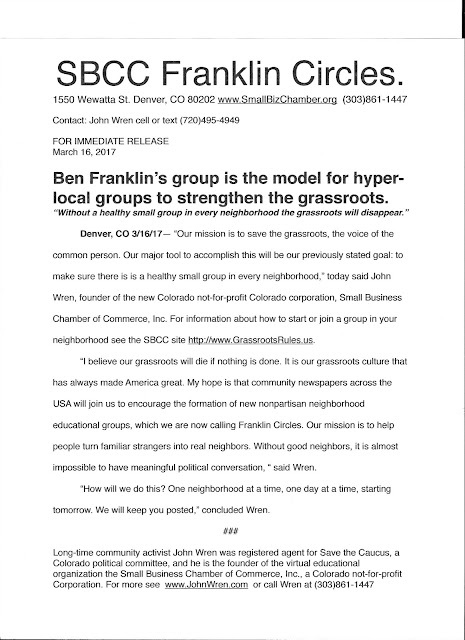 Click above to see media release sent to AP, Colorado Statesman, etc. last Thursday, none have picked it up. This is a very real problem, totally unreported. Please share, attend this Tuesday (7/11) if you can, ok? The Colorado Caucus is the electoral process used in the state of Colorado to appoint candidates for certain political offices and to start the process of electing new leaders for political party leadership. It takes the form of a series of precinct caucuses, meetings of registered electors within a precinct who are members of a particular major political party. The purpose of precinct caucuses is to elect precinct committee persons and delegates to county assemblies, including those that elect delegates to the presidential nominating conventions. The caucus system was adopted by the Colorado legislature in a special session called by Gov. "Honest John" Shafroth in August, 1910 as part of a package of progressive reforms. It was seen as a way to limit the power of party bosses and to attract more grassroots involvement. The caucus system was abolished in favor of presidential primaries in 1992, but restored in 2002 with the defeat of Amendment 29 and co Clerk. Research carried out in Iowa indicates that a well-designed caucus system "brings candidates’ arguments, strengths, and weaknesses into the open". 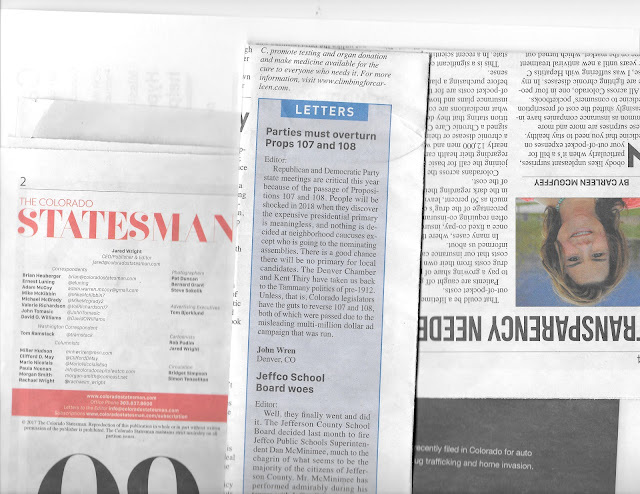 However, it has recently been claimed that the system "is a poor way to begin the party nominating process in Colorado", in that it "is complicated and often disenfranchises all but the most politically motivated participants." Others feel that the Colorado Caucus is the best tool for the common person, the average, ordinary citizen, to be able to serve in elected public office. The late Sue O'brien, Editorial Page Editor of the Denver Post, who some called "the conscious of Colorado" was particularly fond of the Colorado Caucus because it creates repeated opportunities for average, ordinary people to take the first steps toward become political leaders. Caucuses are held in 3,000 neighborhoods across Colorado and are open to the public. Some now meet in homes that are accessible to disabled people, but many meet in public spaces such as schools. The Colorado Secretary of State is charged with the responsibility of providing information about the system. Caucuses are regulated by Colorado law, but expenses for it are paid by the major political parties that use the system. At this time only the Republican Party and the Democratic Party have enough registered voters to use the caucus-assembly system. On March 1, 2016 (Super Tuesday), each of the two major parties (determined by number of votes in previous election) held a caucus in each precinct. Members of both the Democratic and Republican parties chose delegates to represent their precincts at the county conventions. Additionally, Democratic party members participated in a presidential preference poll which determined the allocation of delegates based on their stated intent to vote for a given presidential candidate. Regardless of party, delegates are bound neither to their stated intent nor to the preference given by the population they were chosen by. On the weekend before March 1 caucuses both major political parties had state chairs who unilaterally announced they wanted to see an end to the Colorado Caucus, the system that had been entrusted to their care. Partly as a result of poor leadership, the Colorado Caucus this year was chaotic. st considerations, the fully restored Colorado Caucus was in 2004. To find your precinct number contact your Colorado County Clerk. For citations see this article on Wikipedia. Release: Ben Franklin's group model for new effort. This release just sent to our Denver Media friends. If you would likie to be on the list let us know. New! Be our distributor in your neighborhood. Print out a few copies, see if you can sell them for $1, you keep the money as a thank you. Ask about being a columnist or reporter. Best way to apply, submit something for publication for our next issue. No deadlines, we will produce issue number 2 when we have the first few submissions, this could become a daily publication if we get enough response from distributors and writers. Questions? 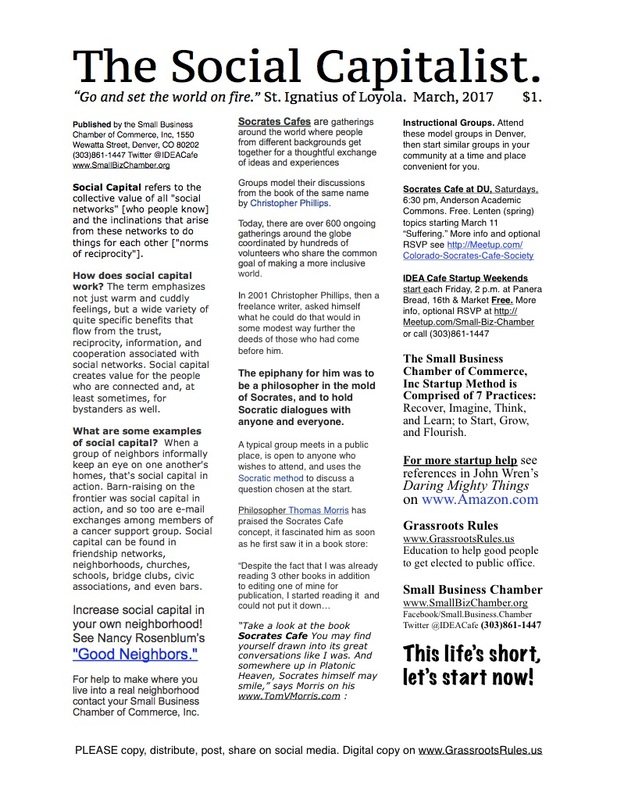 Call John Wren (720)495-4949 If you have news of interest (announce opening or closing of a business, a new small group of interest to someone starting or growing a business, an article you've written about the economics and/or the "how to" of startup or small business. Post here or on our Google+ site, then send snail mail hard copy so we will be sure to see it, along with the date and time you posted here. Click below, then go to "View" to join our publication team online. Thanks! Great tips on good dialog. Best ever TED talk. Learn more, faster, and have fun learning it! How Donald Trump Became President. this 2 hour documentary, it shows the good, the bad, and the ugly. Simplicity is vitally important nowadays, because people are so complex, so filled with fears and inhibitions, so fragmented. 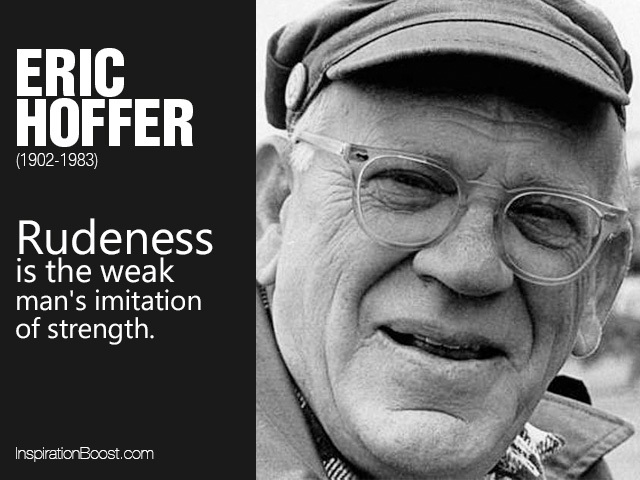 The dictionary tells us that simplicity means consisting of one thing; sincere, artless, and free from affectation, which correlates with innocence rather than sophistication. Apply this to the spiritual life and we see a person who is single-minded, whose mind goes to the essence of things without embellishment and complicatedness. It conjures up a person innocent of guile, truthful and direct, who—psychologically speaking—lives directly, which is a sign of maturity. Now “holy” simplicity is the state of mind and soul that is totally occupied by God. The colloquial word for holy simplicity would be childlikeness and would bring us immediately to the Gospel verse, “Unless you become like children (single-minded, uncomplicated, humble, trusting) you shall not enter the kingdom of heaven!” To be simple also means being emotionally or psychologically simple, in the right sense of the word. It does not mean being naive or foolishly ignorant. Intellectual simplicity should blend with this psychological simplicity, and be practiced in a way that will help us to become spiritually simple—or childlike—as Christ wants us to be. Catherine de Hueck Doherty (1896–1985) was a Russian-born aristocrat who dedicated her life to “the gospel without compromise.” Author of numerous books, she established the Madonna House in Combermere, Ontario. This Lent, during this difficult time when it is almost impossible to see what really is the truth, let's all pray for Donald Trump and our own discernment. We can all do better. Good practice, and it's free! I'm off to a slow start. More tomorrow. Want to start or join a small group in your neighborhood? If you already have a healthy small group in your neighborhood which is important to you, great! Tell others about it on your blog or website, then please post a link to what you have written below. Together we can make sure there is a healthy small group in every neighborhood helping to turn familiar strangers into real neighbors. 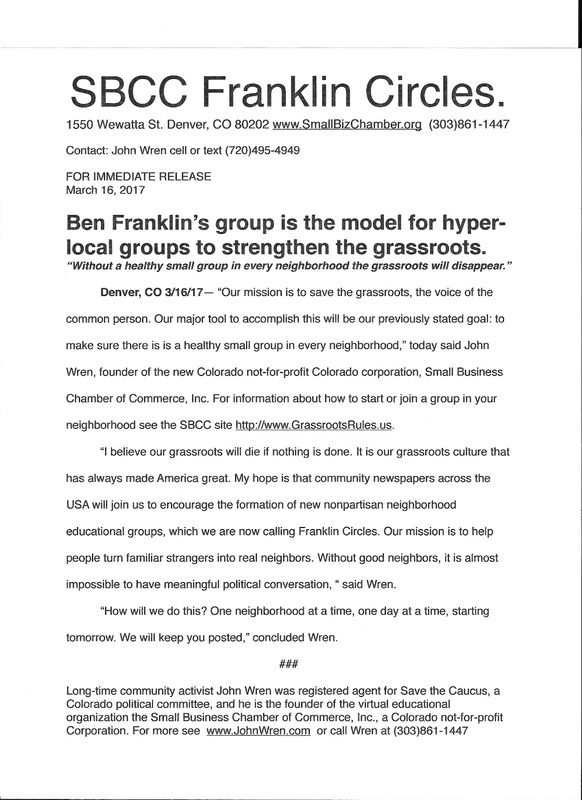 From: Caucus Clubs, Inc. a Colorado not-for-profit corporation. Announcement coming at 3 p.m. Mountain Standard Time. Startup Show, noon Fridays. Then 4:30p at LoDo Panera in Denver. Today we'll talk about the new Caucus Clubs, hyperlocal education and communications, the stumbling start, what's ahead. Then discuss it with us if you can this afternoon at 4:30 p.m., Panera Bread Cafe, with Small Business Chamber's IDEA Cafe see http://Meetup.com/Small-Biz-Chamber for more info and optional rsvp. Walk ins welcome! March for Life! Love your neighbors! New Caucus Clubs. Join us! Give who a chance? Hope? Hope for the best, prepare for the worst. How? Startup Show via link right here a noon MST. 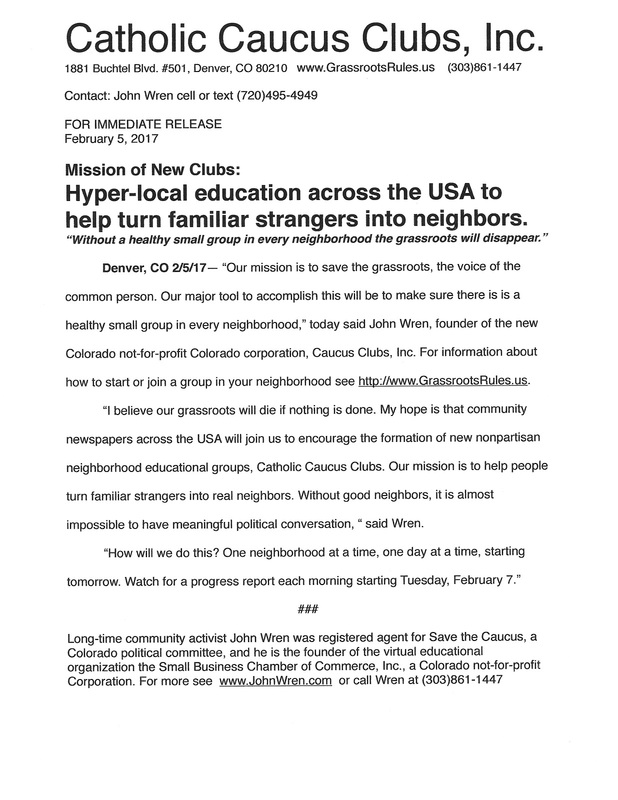 New Caucus Clubs, Inc. a Colorado Corporation is facilitating the formation of neighborhood groups, new and existing. Join us at noon for more.